1. Add the sugar, cornstarch and cocoa powder into a medium saucepan. 2. Gradually pour in the milk as you stir. 3. Heat over medium and continually stir while cooking until the mixture thickens and begins to bubble. 4. Reduce heat to low and cook for an additional 2-3 minutes. 5. Add ¼ cup of the milk mixture to the beaten egg. Stir. 6. Stir in an additional ¼ cup of the milk mixture (this will temper the egg) and return this to the saucepan along with the chopped chocolate. 7. Continually whisk as you bring the pudding to a boil. 8. Reduce heat to medium low and cook for 2-3 more minutes. 9. Remove from the heat and stir in the vegetable oil, orange zest, vanilla extract and orange essential oil. 10. Place saucepan into a bowl filled with ice water. Whisk pudding to bring the temperature down. 11. Transfer to a bowl, cover with plastic and chill for at least 2 hours. This back to school recipe is perfect to make ahead of time. You can put this together while the kids are at school or a day in advance. The colder it gets, the better this back to school recipe tastes. The secret to mastering this kids dessert is achieving the right texture. As long you keep stirring, the pudding will be silky and smooth. 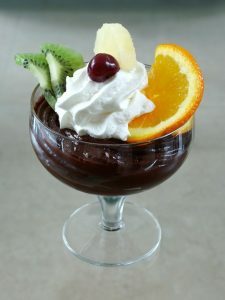 When it is time to serve, just spoon it into small dishes, garnish with more orange zest for color and you have delicious kids desserts. Every spoonful is a beautiful combination of sweet, bitter and acidic that will keep the kids asking for more.